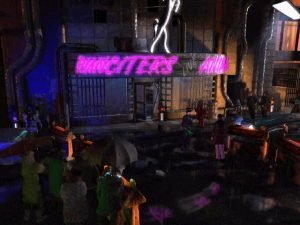 There are many variables and random elements in this title’s gameplay, and more than a few scenes that are merely window dressing or red herrings. This walkthrough is intended to shed light on the puzzles integral to finishing the game rather than the more tertiary goals. Have fun exploring the subplots, and when you get stuck, read further. After speaking to the officer in front of Runciter’s, search the interior of the shop carefully. Speak to Runciter until he gives you a letter, and then click on the security camera dangling from the ceiling to make him give you a surveillance disc. Go to your spinner and head for the police station. At the station, download you data into the mainframe and then examine the images you found in the ESPER. Then go talk to Dino on the third floor, then head back to your spinner. It’s time to take a trip to Chinatown…. Talk to Gordo (the man in red at the counter) and Howie Lee (the proprietor). Zuben (the chef) will become nervous and retreat to the kitchen. Follow him and engage him in conversation. Pressing him about Lucy or asking him to take a Voigt-Kampff test will cause him to overturn his pot and flee. Click rapidly on the floor to the right to avoid being hit by the pot and pursue Zuben. Avoid talking to the man at the dumpster and go through the door and up the stairs on the other side. Zuben will ambush you in the hallway. This is the first major branching of the plot, so choose carefully! Killing Zuben will cause the other replicants to act unfriendly towards you in the future, but you can alternately put away your gun and talk to Zuben (who will then run away) and foster a more positive relationship with the replicants. Once this sequence is resolved you will talk with Gaff, who will suggest that you go home and get some rest. Search the Grav Test Room until you find the dog collar and take out box from Kingston Kitchen [not an appetizing combo, there–ed.]. Return to the control room and click on the small monitor until you receive a disc, then search the floor for the earring and a brochure. After speaking to Crystal and the security guard in the lobby, head back to the police station and upload your clues. Check out the image from the new disc on the ESPER, making sure to scrutinize Sadik’s head, the food carton on the floor, the dog, and the item in Sadik’s left hand. Listen to the Grigorian Interview on your KIA, then go down to the lockup and talk to Grigorian in person. When you are finished, return to your spinner and go to Animoid Row. There are a lot of people to question on Animoid Row– talk to everyone and you will find a few new leads. At the Green Pawn you will encounter Izo, who will flee when questioned about Grigorian. Pick up the camera, then shoot the lock on the gate and investigate Izo’s basement thoroughly. Izo flees to the street by Bullet Bob’s. When you find him there, Crystal will arrive and either arrest him or shoot him (depending on whether or not he is a replicant). You can let her do so, or help Izo get away by clicking on her twice as she tries to pursue him. Next go to DNA Row. After talking to Chew, go across the street to Dermo Design. Shoot the chain on Moraji’s arm and exit the building. Get away from the building as fast as you can. Moraji will be caught in the blast– be sure to question him before he dies. 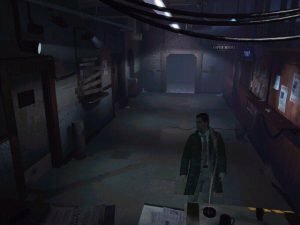 Go up to the twins’ apartment and examine the mannequin with the black mask and the small screen to the right of the mannequin. Then go back and question Chew again. Go to the Bradbury Hotel by following the alley next to Chew’s. There you will glimpse Sadik, who will flee up the ladder in the bathroom. Follow him upstairs and climb up to the roof by breaking the glass in the bureau to create a ladder. This is probably the most non-linear act in the game, and many of the possible actions can be completed in any order or skipped entirely. The critical elements of this act focus around Lucy, Gordo, and Dektora, who can be encountered in any order. The first order of business is escaping from the Yukon Hotel. Bump your chair towards the back of the room (by the window) and you should be able to find a sharp surface on which you can cut your bonds. Make certain to search the room before you leave. 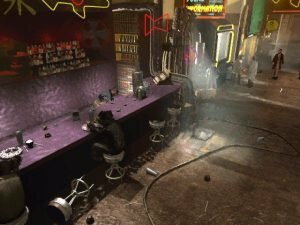 Gordo can be found on Nightclub Row, in Taffy Lewis’ bar. It can go a number of ways, so be prepared. There are a number of different ways this encounter can go, pretty much all ending in a confrontation on the street. If Gordo has a gun then he is a replicant– you can choose to either shoot him or let him go (but draw your gun either way). If he does not have a gun, always let him go. Conversation may be possible, depending on whether or not he likes you (which is in part determined by how you treated Zuben in Act 1). Dektora performs in Early Q’s bar across the street. Click on the dancer to distract Hanoi, and then click on the revolving booth to enter Early Q’s private lounge. Speak to Early Q and watch Dektora perform, then follow her to her dressing room. Your conversation will almost always end with Dektora running off. If she is a replicant, follow her up to the projection room. Like Gordo, you can shoot her or let her go (your options may be limited by your past actions). Shot Five Lucy hangs out at Hysteria Hall– you may have to keep checking back to find her. Your meeting with her will inevitably lead to a chase through the Hall of Mirrors. You can shoot her, talk to her, or simply let her escape. If Crystal came with you to Hysteria Hall, the only way to keep Lucy alive is to catch up with her and speak to her (if Lucy exits the back door, Crystal will kill her). The majority of this act takes place in the sewers, where the player may be attacked by a variety of assailants. Anything that comes after you is fair game, including the police (who are all on Guzza’s payroll). Keep your gun drawn at all times while exploring, and move quickly… you never know when the police will pop up. The object of this act is to find the evidence that implicates Guzza and clears your name. The twins have it—how you get it is up to you. You can kill them and take it (the other replicants will not appreciate this), or you can help them by stealing the DNA information they need from Tyrell. Choose the “Guzza” conversation option first if you want to do this. You will have to break into Tyrell, accessible via the other door at the back of the twins’ lab. Once inside, take the elevator up to Tyrell’s conference room and grab the DNA data on the table. Once you have the dirt on Guzza, you will have to call him and set up a meeting from the phone at the back of Taffy Lewis’ bar. How the meeting goes depends on how you have played. If you have killed any replicants (or any of their friends), you will want to run as soon as Clovis kills Guzza. If you are on the replicants’ side, you can earn brownie points with Clovis by killing Guzza before Sadik does. Either way, returning to your apartment ends the act. 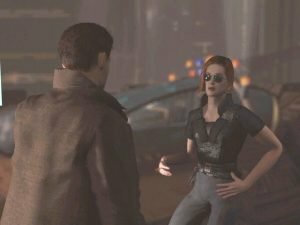 The end of the game can go a number of different ways, but the two most common involve either helping or hunting the replicants. If the replicants are on your side, Maggie will be dead in your apartment (killed by Crystal) and Clovis will be buzzing you on the telephone. Leave your apartment via the front door and enter the sewers. Go over one scene and go through the door at the back of the room to put yourself on the path to the Kipple. Keep your gun drawn and watch out for rats and Crystal (who will be waiting for you at the moonbus). The fuel for the moonbus can be found in the metal rubbish on the left side of the scene in which you kill Crystal. If Crystal is on your side, Maggie will be missing when you return to your apartment, dog-napped by Sadik. Crystal will be buzzing you on the phone– go meet her to finish off the replicants. There is a bomb in a narrow, cluttered passage in the Kipple– if you click the blinking light before Crystal walks past you can save her life. Once you reach the moonbus, Maggie will come running for you. Watch out—Sadik has turned her into a bomb. Kill Sadik and enter the moonbus to finish things off. If Crystal is killed, you will get a visit from Gaff and a special “movie” ending. Several other endings are possible, some of which do not involve the moonbus at all. Find them if you can…you are on your own now, Blade Runner.